We’ve made it. 3 games left in the 2017 D1 men’s lacrosse season. It’s been a wild ride, with more #1 ranked teams that you can shake a stick at. And as if the lacrosse gods were really trying to get that message across, our first semifinal is Towson vs Ohio State. Programming note: this game will be broadcast on ESPN2 at 12:00 ET on Saturday afternoon. Haha, we aren’t that kind of analytics site. These are two very evenly matched teams. 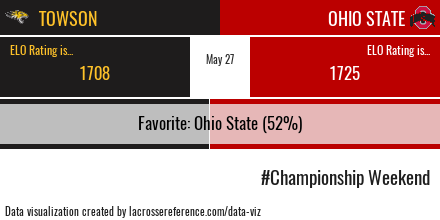 Our Lax-ELO model thinks that Ohio State is an extremely narrow favorite. But the hoopla around championship weekend by itself introduces enough margin of error that we can confidently say that this game is a toss up. The model thinks that Ohio State is a slightly stronger team, but as to who wins, your guess is as good as mine. Ohio State comes into this game as the consummate jack-of-all-trades. Their overall offensive efficiency of 29.8% places them comfortably in the top third of the nation (21st overall). Their defense allows goals on 24.8% of their possessions, good for 17th in the country. They’ve been a slower than average team, taking 42.9 seconds on average before a first shot (23rd slowest in D1). Towson is a more one-sided team. Their offense is thoroughly average, efficiency-wise. They’ve scored on 27% of their possessions, which is 37th in D1. Their defense is the crown jewel of units in this matchup. They’ve allowed goals on 23% of their possessions. This puts the Tigers in the top 10 in that statistic. They’ve also been one of the slowest teams in all of Division 1, taking an average of 49.8 seconds before launching the first shot of a possession. This puts them 69th nationally. This deliberate style is the primary reason that they had the 3rd most possession of any team, with 32 minutes per game. The Tigers were not a deep team, getting a weighted contribution from 14.4 players per game. That makes them the 19th thinnest team in D1. Raw numbers aside, there are some deeper statistical trends that are worth keeping in mind. 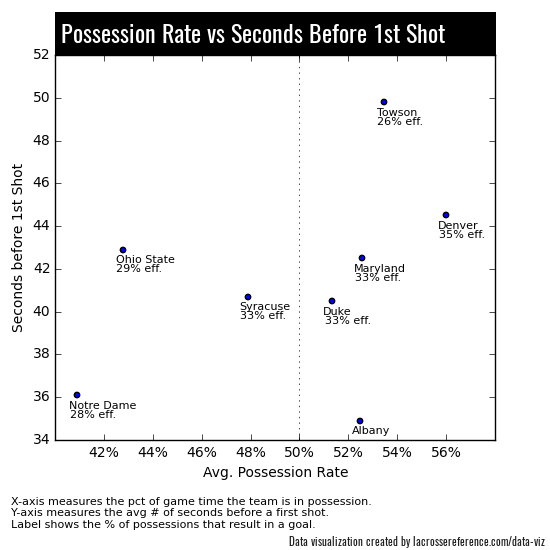 Can OSU have as much success off Faceoff wins as they did against Duke? We talked about the impact of OSU’s face-off game in our Duke preview article. The Blue Devils, as a defensive unit, were much worse against possessions that started with a face-off win than against all other possessions. The result: Ohio State scored 9 goals off of their 17 face off wins. Some teams have been able to outperform against Towson, but all those blue dots on the far left side indicate all the teams that haven’t. At the very least, it’s not a defensive liability like it was for Duke. 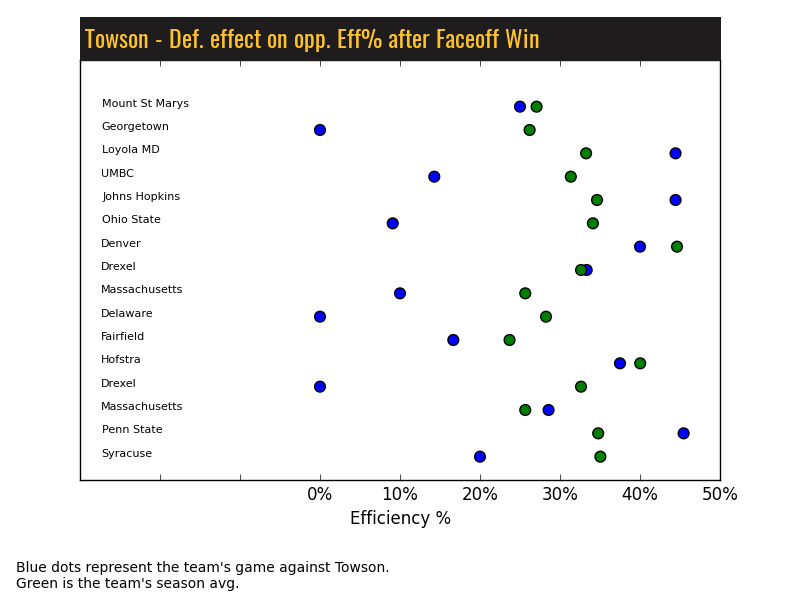 Conversely, Towson’s worst defensive performances have come after the opposing defense stops (or backs up) a Towson shot. They are the #8 defense overall, but on possessions that being with a defensive stop, they are just 29th. Perhaps Ohio State can make up some of the difference on these possessions. But the bottom line is that one of the big advantages that the Buckeyes had against Duke is not going to be as big of a deal against Towson. Can we learn anything from their first game? These two did play earlier this year. And while it was a bad weather game early in the season, I think it would be silly to not at least take a look and see if there is anything we can take away. The biggest thing that is that Ohio State was able to win the time of possession battle. 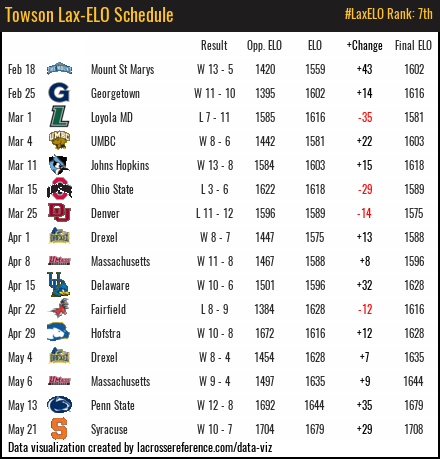 Towson has only won a single game this year when they’ve lost the time of possession battle. And weather might affect the skill-plays in a game, but you wouldn’t expect it to affect who wins time of possession. This is crucial for Towson in the rematch. The other nugget is the huge disparity in face-offs. Ohio State was not able to convert but one of their face off possessions into goals. But the fact that they had a 9 possession advantage, thanks to face-offs, is still important. 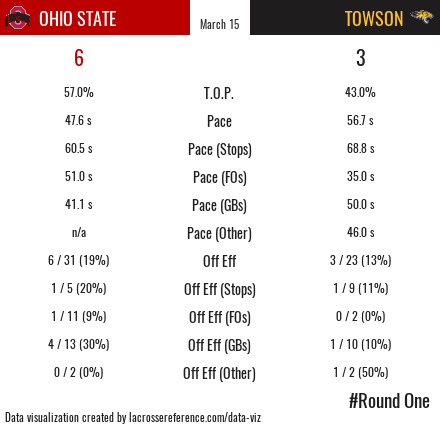 We typically care more about whether face offs turn into goals, but against Towson, a team that needs possession to win, the fact that face-off wins conferred a time-of-possession advantage on the Buckeyes is significant. Mr. Woodall, you have your work cut out for you. So then, should Buckeye fans care about T.O.P. in this one? I think so. Towson is the #3 team in the country heading into this game in time of possession. Ohio State is 66th. The curious thing about Towson is that they’ve built up that possession advantage in a unique way. The chart below shows all 8 quarterfinalists, along with their possession rate (x-axis) and the average amount of time before they take an initial shot, per possession (y-axis). They are clearly the most deliberate amongst this bunch. Compare Albany and Towson; similar time of possession rates, but Albany takes a first shot on offense a full 15 seconds before Towson. 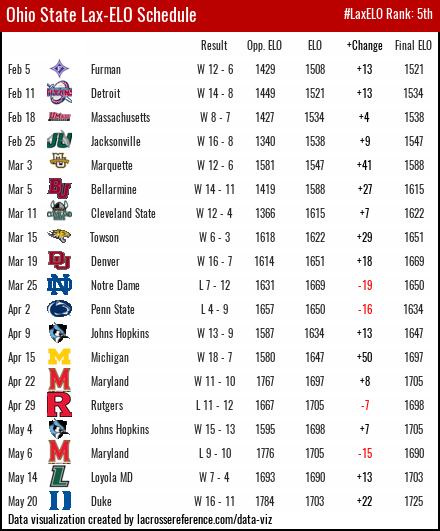 And wouldn’t you know it; Towson leads all of D1 with 32 shot clocks assessed. This is a team that doesn’t mind getting the shot clock put on them. Now why would this matter? Well, it only really matters if Towson gets out to a lead like they did against Syracuse. As noted above, Ohio State is clearly comfortable playing without winning time of possession. So a close game or an OSU victory where Towson wins T.O.P. wouldn’t be a surprise at all. But against Syracuse, Towson had the ball for nearly 38 minutes. And we know that they are comfortable in situations where the shot clock is put on because they’ve been through it 32 times this year. If Ohio State gets down, they’ll be trying to come back against a team that 1) is very experienced holding the ball and 2) is extremely used to having the shot clock put on against them. With Fannell and company, I don’t think any deficit is an impossible hill to climb. But the climb will be a lot steeper when you’ve got Drenner, Seider and the Towson offense taking the air out of the ball.